To filter small amounts of tinctures (less than 200 dal), we recommend to use the Multifunctional system for filtration of small amounts of products (see Introduction to the section “Filtration of components”). To filter batches of tinctures less than 100 litres in volume, it is expedient to use minisystems equipped with capsule filters. 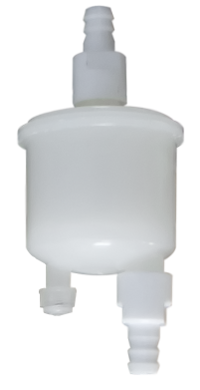 A capsule filter is a ready-for-use one-piece filter which constitutes a minicartridge soldered into a polypropylene holder. Capsules are intended for quick and effective filtration of small amounts of liquids and gases. They are especially effective in critical applications, where filtration of individual batches of the product is needed (one-off use). Capsule filters can be washed and then autoclaved, making it possible to use them repeatedly until full exhaustion of the whole filtration surface. By using capsule filters, it is possible to carry out small-scale pilot tests at early stages of development of the filtration system for the purpose of selecting an optimum combination of filters, especially for treatment of hard-to-filter solutions, without making investments in stainless steel equipment. A capsule filter has a high-strength leak-tight polypropylene housing and is provided with various filter materials in a broad range of pore sizes. One-piece, tested and ready-for-use filtration systems. Chemical stability depends only on the material of the filter. Perfectly suitable for solutions containing ferments that are sensitive to metals. The fluid being filtered (tincture) should be delivered under pressure. To this end, we recommend to use special 10 or 20 litre pressure tanks made of 12Kh18N10T stainless steel, to which a compressed air line (compressor) can be connected. The tincture is delivered from the pressure tank to the capsule filter element.